Just 1 thing for reducing cellulite!!!! The ONE thing which will be the major part of this post but we’ll also go through a lot of related topics as well which will help you in your overall wellness regimen. First, lets figure out what it actually is and do we really really need to hate it as much as we do??? Now, if just like any other smart city girl you Google it, you will be surprised at the words used in some of the webpages!!!!! Making cellulite sound as if its something repulsive. There are words like unhealthy tissue, swollen fat lobes, bulging chambers and what not…. Anyways, may be that’s how they ( and also would like US to) look at cellulite. But we don’t HAVE to…. Cellulite is a girl thing !!!! Lets begin by accepting and celebrating that (phew another one to the list!!!!) Women (as against men) have tendency to deposit their fat content as subcutaneous fat , which is the fat layer just under your skin. But hey nothing wrong with that !!!!! That’s what gives your body a more feminine form with your curves and stuff!!!! !Since when did that become bad!!!!!! feels the strain as the fat deposits increase and that’s what leads to the dimpling effect on the skin. Which is what we have been programmed to hate. Cellulite is the fruit emerging from the seed of unhealthy habits and just plucking the fruit out and trying to destroy it will not get you anywhere coz it’ll bloom again next season!!!!! So a sharp eye on overall fitness is imperative. So making sure that you exercise (strength training and Cardio not just low intensity walks), eat clean and healthy (read unprocessed) and drink lots of water is completely non-negotiable. Now I know that complete blogs can be written on each of these topics so will try not getting digressed and focus on that ONE thing that can help you assuming you are doing or are at least aware and sensitive of the three mentioned above. So what is it????? Dry brushing!!!!!! It is the single most effective procedure that I have fallen in love with also because it will make sure that there are at least a few days when you keep your skin chemical free( if you are into body scrubs or loofahs with shower gels etc.). Of course,any exfoliation that improves the blood circulation works well so massages or even the traditional ‘Ubtan’ can help but they are much more time consuming and messy too. This gets done in 5 min flat. So what do we do???? Select a dry brush that suits your style. Now, I will agree these are not available everywhere yet in India. I have one from The Body Shop which works well. For that matter while i went into my washroom hunting for brushes guess what all I found!!!!! So yes…. you can call me the exfoliation queen!!!! and after using all of these when I tell you dry brushing works best …you better believe it!!!! So coming back to my dry brush….. The idea is that you can basically select any brush as long as the bristles are firm but soft enough so that they don’t scrape your skin off when you Dry brush but gently exfoliate and improve the blood circulation. So how to do it???? 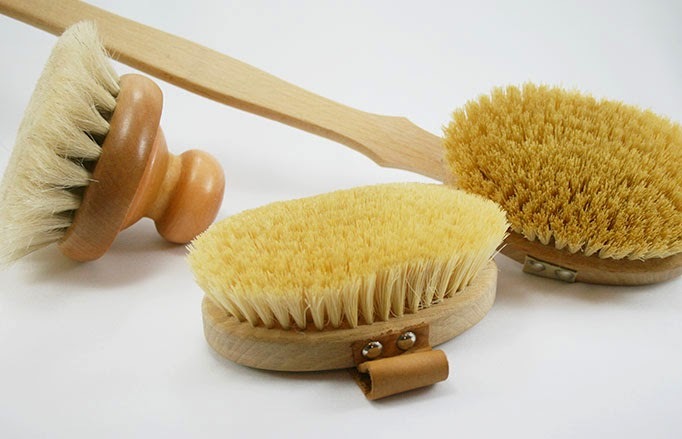 Basically before your shower take your dry brush and start brushing all over from wrists towards the elbow, from elbow towards the shoulder, from ankles to knee and from knee upwards all around your thighs in nice long sweeping straight strokes. Do not forget the shoulders, sides of the ribs, from waist upwards towards the torso. If this description doesn’t seem clear enough you can search YouTube videos on dry brushing too. Basically, feel free to explore around this wonderful technique that will do wonders for your cellulite reduction. Also, do help me out by sharing this link far and wide helping the larger sisterhood of City Yogis!!!!! !